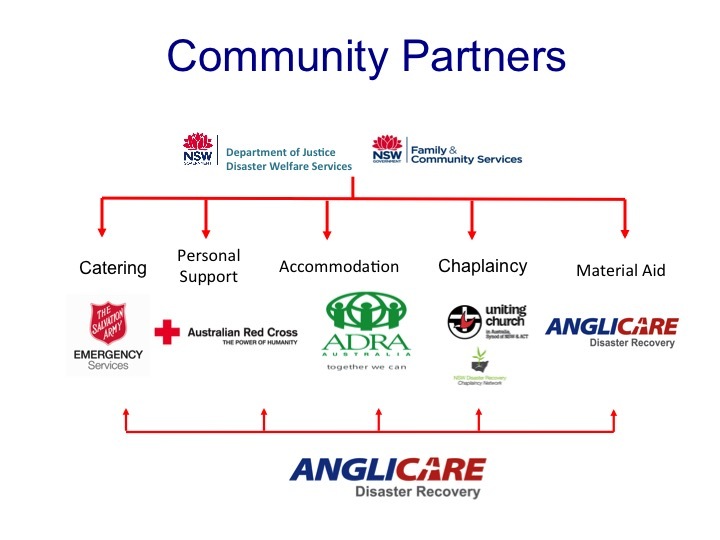 The Disaster Recovery Chaplaincy Network (DRCN) is an ecumenical network of chaplains established to assist people in NSW who have been affected by disasters and major emergencies within their communities. The network was established in 2009 by the Uniting Church (Synod of NSW and ACT) as a result of deliberations within the State Disaster Welfare Committee, which recognised the need for chaplaincy to complement the other welfare services within evacuation and recovery centres following major emergencies. When disasters strike, people are affected in every aspect of their lives, physically, emotionally, psychologically and spiritually. Holistic care must account for all aspect of a person’s experience and need. Issues of meaning, justice, forgiveness, hope and worldview have spiritual elements. These are all challenged at a time of major loss, and many people connect these things with their own faith or spirituality. Holistic care should allow for pastoral and spiritual care and comfort in this context. While other services and groups will aid in taking care of people’s physical and emotional needs, chaplaincy seeks to support people’s spirituality. Provide pastoral presence and support to people and communities following disasters. Provide resources, training and support to local ministry agents as they, in turn, support their communities in recovery. The DRCN is coordinated by the Uniting Church in Australia (Synod of NSW and ACT) but incorporates volunteer chaplains from a wide range of Christian denominations and other faith groups from across the state. The Synod Disaster Recovery Committee has oversight of the network’s operation. The Senior Chaplain/Coordinator of the DRCN is Rev. Dr. Stephen Robinson who operates full-time as the Uniting Church’s National Disaster Recovery Officer. The DRCN has a team of Duty Officers and Logistics volunteers who maintain the life and work of the network on a rostered basis. Under the state disaster welfare arrangements some core Community Partners work under Memoranda of Understanding with the State Government’s Department of Justice - Disaster Welfare Branch to provide care for people and communities following disasters. DRCN chaplains are ministry agents who are ordained or equivalent, including chaplains working in institutions such as hospitals and aged care facilities. Chaplains must be nominated by denominational or faith-group overseers and deemed to be suitable in nature for this ministry. They participate in specialised training where they are further assessed. Chaplains must have current Working with Children Checks and will adhere to our Code of Ethics and Guiding Principles. What faith groups are included in the DRCN? Note: There are footnotes (see bottom of page) with hyperlinks that need to be included with this content on the website. The Australian Partnership of Religious Organisations (APRO).